Kasih, the new Indonesian restaurant nestled in the corner of Little Tokyo’s AVA apartment complex, presents a cuisine that is bold and wonderful. It is a delightful bright spot in DTLA’s ever-expanding restaurant world. Indonesian foods have a fascinating flavor profile. It is a cuisine where sweet and sours tastes dance across your tongue. Where vinegar, acid and salt play as grace notes: never overwhelming and always surprising. 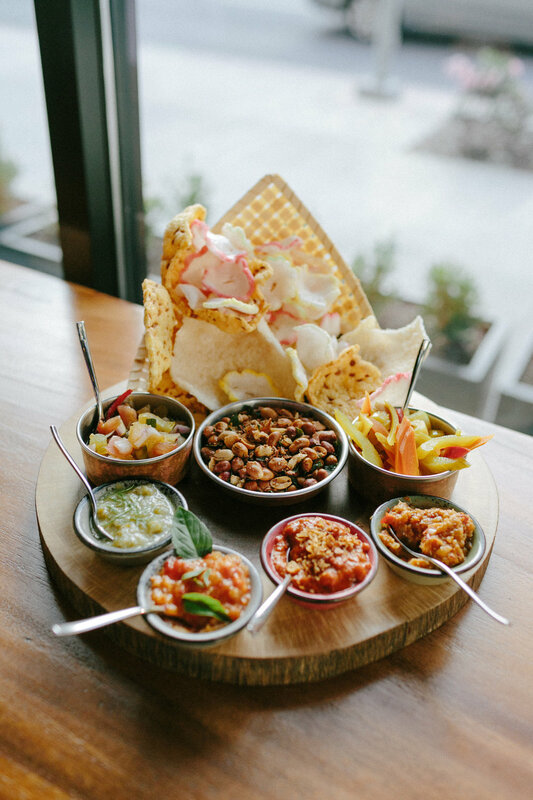 The starter is a sambal tasting (dips and “salsas” of various levels of spice, tumeric infused pickled vegetables, and puffed shrimp, garlic, tempe and poppy seed crackers) and Hamel’s signature Zach Snack (Indonesian spicy-sweet bar nuts); a fun and colorful presentation. The tasting looks like an edible centerpiece, and is a lovely introduction to the rest of the meal. Hamel points to the rendang -- considered one of the most delicious dishes in the world -- which at Kasih consists of curried, tenderized beef, sauteed spinach, pearl onion and fingerling potatoes (“Indonesia’s version of meat and potatoes,” he says). It is jaw-droppingly good. Pause for a moment and let your brain catch up to your tongue good. Order a second serving good. Kasih’s cocktails are Indonesian twists on classic drinks, where lychee juice, ginger-turmeric palm syrup and pluot bitters meld with vodka, mezcal and bourbon. The highlight is the Kuno “Old Fashion”, which is one of the nicest Old Fashioneds to be found in DTLA. And lest we forget the coffees and desserts. Ray Harsono, who hails from Indonesia, mans the coffee program. He ensures that each espresso shot is precise and each drink is perfectly balanced. He beams with pride for his home country’s coffee, which he boasts is the best in the world. Indonesian coffee is at once sour, sweet, fruity and complex, much akin to the rest of the cuisine. Kasih is a delight for the senses. A beautiful space, a wonderful meal, and divine drinks. Kasih is a perfect pairing for downtown LA: Bold and exciting, at once modern and familiar while existing entirely in its own world.